Some days one gets inspired and then it fades…. So was the case with the Moby image today. He was laying on a sofa with his paws dangling off the edge and head resting at an odd angle over one of the fore legs. I started with graphite and never quite captured his nose and eyes correctly. Then I tossed a couple of washes over the micron pen and it still wasn’t working. Now it’s relegated to the back burner. At least it felt more productive than reading research papers on forest ecology, rotting wood, soil, carbon sinks, bugs, plants and probably other stuff that’s dropped from my brain since yesterday. When I jump into a specific scientific based project I try to read as much background information as possible to help my brain figure out the best approach to the project. Hopefully I don’t waste too much time with it all! Time to get out and feel productive. I have a whole bunch of grass and weeds screaming for a haircut! Beautiful Gale – great expression in those eyes. Ah, your post hit me at just the right time as I pondering how to proceed with a white shell. Moby is much more interesting and really beautifully rendered! Thanks Cathe. I was procrastinating moving forward with pulling out the xacto blades. Overall, it was a good thing since it pushed me into actually wanting to cut paper. Frustration can be an excellent motivator! I love this! Such an interesting angle, and I like the unfinished nature of it, the colour concentrates focus on those wonderful eyes. I have a thing for dog eyes. Maybe one day I’ll branch out and work on other critters or people. The angle is skewed mainly due to the camera angle. It made it look even more wacky. 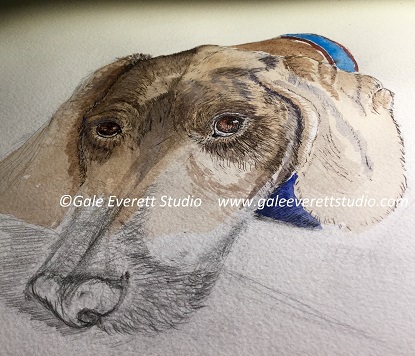 You will only know if you captured Moby correctly…but it is a lovely start to a dog portrait! Problem with my dog is he is black…and I am having the hardest time with it! I keep having friends ask for dog portraits of their black Labrador. I live with a black cat and I almost never draw him for the same reason. Black pets are hard to work with. I’ll get there eventually. Thanks for your positive support!